You love your home, but do you love the air inside it? Georgia Air Specialists offer a number of ways to clean and freshen the air in your home so you can breathe easier without compromising comfort. Our indoor air purification systems will keep your family breathing clean air year-round. Learn more about the systems we recommend and how you can keep your home’s air as fresh as possible. A person can spend 90% of their time indoors, and that’s especially true during the hottest parts of the summer in coastal Georgia. Nowadays, homes are better insulated and more tightly sealed, which means indoor pollutants can get trapped inside your home. As a result, your family might be breathing indoor air that is up to five times less healthy than what’s outside. 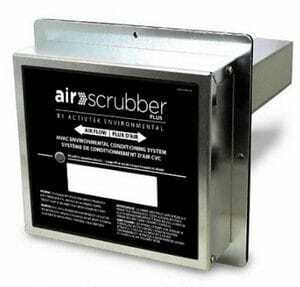 Air Scrubber Plus® is a Seamless, Fully Integrated, 24/7 Whole Home Purification System newly offered by Georgia Air Specialists. You’ll notice less buildup, making your home look and feel cleaner, while protecting furniture and electronics. With a high-efficiency air purifier, you’ll keep your air conditioner’s cooling coil clean and your furnace working efficiently; saving energy, minimizing repair costs and extending service life. Standard furnace filters are less effective and need to be changed more often. When it comes to your comfort, we know it’s more than keeping you warm in the winter and cool in the summer. Georgia Air Specialists offer a full line of indoor air quality products to make sure the air that you breathe in your home is fresher, cleaner, and more comfortable every day of the year.